After your doctor tells you surgery is required, it can be both frightening and intimidating. There are some things you can do to ease some of the stress involved prior to having orthopedic surgery. By asking your surgeon these five questions, you should better understand what to expect and hopefully ease your anxieties as well as become better informed before undergoing an operation. What exactly will the surgery and the recovery be like? As with most professions, surgery has its own lingo and jargon. It makes sense to the surgeon and the medical team, but sometimes the lingo and jargon does not make sense to the patient. Ask for specifics about the prep for the surgery, what will happen during the surgery, and what to expect during recovery. How much experience has the surgeon had with the surgery and what outcomes has the surgeon had? If you are anxious about the surgery, you will want to have a surgeon with experience — a surgeon who has a history of good outcomes with the surgery. For example, if your surgeon has a higher than average incidence of complications, this is important to know and possibly avoid. Why is it necessary to have the surgery now? Perhaps having the procedure now is convenient for the surgeon, but it’s not convenient for you. Find out if the surgery can be delayed without creating more harm and making the surgery more difficult or adding complications to recovery. 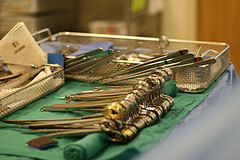 There is a stereotype about surgeons: They like to perform surgery. Be sure there isn’t therapy or another option that can make the operation unnecessary. Perhaps a torn meniscus can heal with therapy and rest. If you are not an athlete, rest and therapy could be the best options. For those who do like to be involved in sports, surgery might be the best, and even the only, good choice. What kind of anesthesia will be required? If you experience complications with a certain kind of anesthesia, make certain the surgeon fully understands the complications — if necessary the surgeon can make adjustments to ensure your surgery will go as planned. Asking questions and understanding why, when and how the procedure will take place will help ensure that you will have a positive experience with the surgery. An active and involved patient is knowledgeable and understands what will happen to his or her body, and will be more at ease with the procedure. The team at Southeast Orthopedic Specialists has a great deal of experience helping patients prepare for their orthopedic surgery and their recovery period. If you have any questions about preparing for joint replacement surgery or what to expect afterward, always feel free to call or contact us online.